That is my little collection of tea. 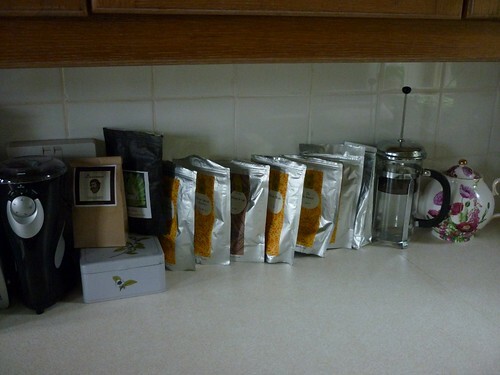 There’s tea from the Sip N Stitch shipments (the third tea is in the container that’s next to the coffee grinder) and tea from Palais des Thes in Brussels. There’s more tea in the cupboard (ie O’s Earl Grey). The whole reason why I’m showing all this? I went on a little cleaning spree yesterday. I took everything out of the cupboard, cleaned it (found licorice that expired in Dec 2008! ), and decided I should rearrange everything so that there’d be more counter space. So now, instead of hiding all of my tea, that’s out on display and all the ugly stuff that was cluttering the counters? In the cupboard all neatly organized. I hadn’t realized how much I disliked being in the kitchen until after I’d cleaned it thoroughly. Now there’s more space and I don’t feel claustrophobic. Things won’t to topple over when you walk by. In hindsight, I probably should’ve taken a a before picture just so you all could see how bad it was. Oh well, too late for that. In knitting news, I finally cast on Snow White yesterday. I’ve already completed the waist decreases and if I remember correctly, on the next round I’ll be starting the panel bits at the front. It is such a fast knit. But I do need to be doing something else at the same time, like listening to podcasts or watching TV, because 2×2 ribbing can get boring. It’s a good thing I’m working with Malabrigo. It’s like a dream to knit with. No splitting, it’s fairly even, sooooooooo soft.